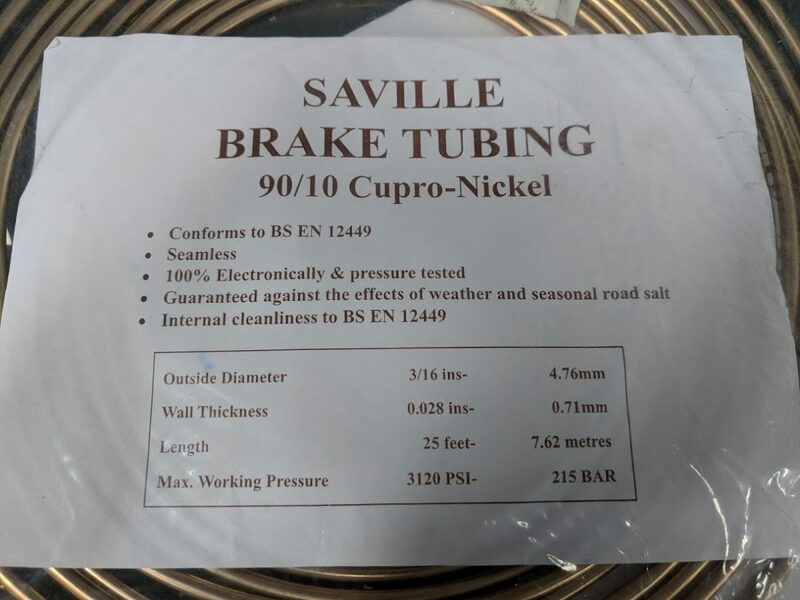 Copper Nickel alloy brake lines, otherwise known as Cupro-Nickel, Kunifer or Cunifer, are mainly used in Europe to protect the braking system from failure due to corrosion caused by salt on their roads. In Australia there is no salt on the roads, unless someone drops their McDonald’s chips, so the product is not widely known or used. Cupro-Nickel came to my attention as an alternative to zinc coated steel bundy tube in early 2018. It appealed to me for three very good reasons. It’s made out of 90% copper and 10% nickel. The nickel is added to combat work hardening of copper which leads to failure over time. This potential failure of pure copper lines has cast doubts as to the legality of Cupro-Nickel in Australia. It’s this question which led me down the path of research as I would love to use it for my project with peace of mind. All components and devices in the Brake System must meet or exceed at least one appropriate recognised international, national or association standard, where such standards exist, or the relevant parts thereof. (Recognised can be taken as meaning AS, SAA, SAE, BS, JIS, ISO or DIN standards). Hydraulic pipes must be made from steel bundy tube complying with SAE J1047 or equivalent. All hydraulic pipes must be double flared in accordance with SAE J5336 or equivalent and appropriate flare connections must be used. Hydraulic pipes must not be welded, brazed or silver soldered. Hydraulic brake hoses must comply with SAE J1401 or equivalent. Flexible hoses complying with ADR 7/… or ADR 42/ 04, including braided brake hoses, are also acceptable. Copper tubing must not be used for hydraulic brakes. Hydraulic brake pipes must not be joined by brazing or silver soldering. They must be joined by appropriate flaring of the tube and associated fittings. Threaded bosses used for braking component mounting must have full depth thread engagement of at least the bolt diameter. They’re pretty clear that no copper tubing is to be used but does this also exclude copper alloy blends? The Cupro-Nickel tubing conforms to BS EN 12449 so where the bulletin states “Hydraulic pipes must be made from steel bundy tube complying with SAE J1047 or equivalent”, surely the equivalent British Standard EN 12449 is its, well, equivalent. …users should contact their relevant Registration Authority prior to commencing any work. Which is what I did. I rang the NSW Roads Authority (RMS) technical assistance line hoping for clarification but instead someone read out the above bulletin word for word. It appears they can also search documents… I had hoped for a better result as I have read on forums that they have been advised that Cupro-Nickel is fine to use by the RMS. I guess the advice given might depend on who happens to answer the call. The gentleman suggested I ring around their licensed certifiers (pdf) for further clarification. I rang 5 of them, 4 of which were rather helpful. The consensus was that the Cupro-Nickel is fine to use and certification is not required for such a small like-for-like change to an OEM material. They all offered to certify it for my peace of mind but were clear it was not necessary. One made the point that the pipe had to be seamlessly extruded and another said as long as it meets or exceeds an equivalent standard then there is no issue with using it. Tick and tick! This Brake Assessment Manual is intended to be used to assess the brake systems of modified vehicles and individually constructed vehicles as part of the process for certifying the vehicle for registration in accordance with the Road Transport (Vehicle Registration) Regulation 2007 and the Vehicle Safety Compliance Certification Scheme (VSCCS). Rigid brake lines must not be welded, brazed or soldered but must be double flared in accordance with SAE J5336 or its equivalent. Copper brake lines must not be used but copper-nickel alloy or “Cunifer” tubing is acceptable. Clear evidence that it is acceptable to use in NSW, Australia. I discussed the above document with the certifiers and while they weren’t aware of item 12 (can’t blame them for not committing a 45 page document written for brakes to memory), they all agreed that if Cupro-Nickel was specifically mentioned then it is obviously acceptable. The above applies to NSW and if you intend to use Cupro-Nickel in another state I would advise you talk to your local roads authority for further clarification.